I just visited my daughter in Seattle for the Thanksgiving weekend. It reminded me of how chaotic the holidays can be. I’ve decided to list some common sense tips to keep the cheer going. A wonderful holiday tradition that can lead to disaster with your pup. Anchor your tree to a wall or ceiling to prevent it from tipping. Make sure non-breakable ornaments are towards the bottom of the tree. Tinsel can be deadly for dogs so avoid using altogether. Setup the base so that your dog cannot drink the water. It typically contains chemicals which can cause severe indigestion. Pine needs can puncture your dogs intestines. Sweep regularly and immediately head to the emergency vet if ingested. 3. Avoid poinsettias, mistletoe and amaryllis. These are highly toxic to your dog and should be avoided completely. 2. Keep your sweets away fro the pups. Peppermints, cakes, cookies and especially chocolates can cause deadly illnesses. Turkey and chicken bones can be dangerous for dogs to digest. They can easily break and cause choking or get stuck in their gums. 5. Be careful with the cold and snowy weather. 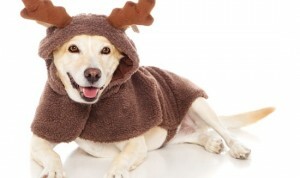 Falling temperatures can be dangerous for your dogs. Think twice before leaving them outside when guests arrive for holiday festivities. 6. Do not dogs as surprise gifts. Well intentioned gifts usually end up in shelters. It takes more than a warm home, food and water to take care of a dog. Dog adoption should be a well thought out and educated process. 7. Keep your dogs relaxed. Exercise your dogs prior to guests arriving. Dogs tend to get very excitable with guest arrivals. At least a 30 minute walk or intense play time. Meeting unfamiliar guests can cause a lot of stress to a dog. Unusual commotions around the house can also add to their stress. Have them stay in a room with a cozy blanket and their favorite toys. You can bring them out when things have subsided. 8. Don’t forget the water. Dogs tend to pant a lot more when stressed so they’ll need more water than usual. 9. Keep the snow globes out of reach. They usually contain anti-freeze which is highly toxic. If it happens to break and spill, immediately send the dog out of the room and clean the spill. 10. 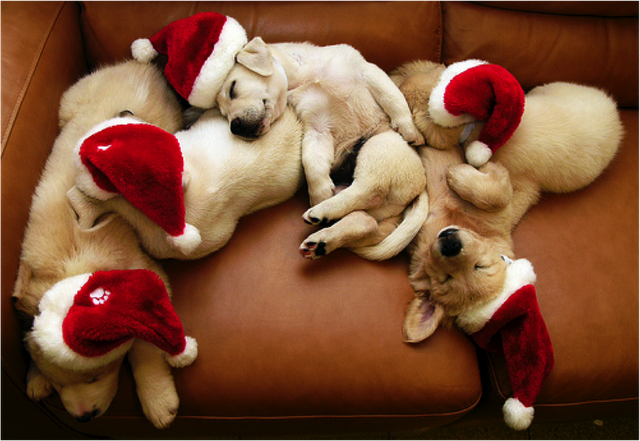 Don’t forget to add your dog to your gift list! Keep your dogs occupied during the holidays with new toys!